List of ESPN personalities set to cover the game. Maryland has “so many weapons” this year. Even if unspoken, Oregon has a postseason destination in mind. For the first time in years, North Carolina is ready to dominate. Duke will face a tough road test Sunday at Northwestern. New-look UTEP will be faster and more explosive this year. UConn heads into new territory this season. After years of perfection, could this year be UConn’s stumble? Words from Indiana’s Brenna Wise. Marina Mabrey was out for Notre Dame’s season opener. Coach Dawn Staley and Bianca Jackson on how she’s become a veteran for the Gamecocks. Redshirt freshman Amandine Toi will miss a second straight season for Virginia after injuring her knee in practice. She will have surgery. CMU legend Crystal Bradford returned to campus for the team’s season opener. 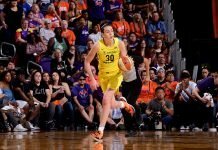 WomensHoopsWorld has a top performers list. ESPN has a writer-voted list. Rutgers coach C. Vivian Stringer coached her 999th career win today. Lindsay Whalen is breaking records for Minnesota again. How Matt Insell reunited with father Rick at MTSU. Jim Littell sees promise in young, guard-oriented Oklahoma State. A source says Minnesota Lynx assistant coach James Wade has been hired as the Chicago Sky’s new head coach. A’ja Wilson has returned from China to rehab a knee injury.